3000 hr. Halogen Spot, G-4 Base, MR 11. 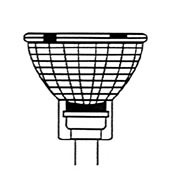 35W, 12V fits our halogen quartz lamp socket item No. 48363 (search 48363). No reviews yet for the G-4 Base, MR 11 Halogen Spot.